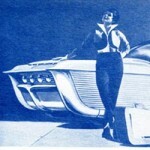 It’s not fiberglass – but it should be. 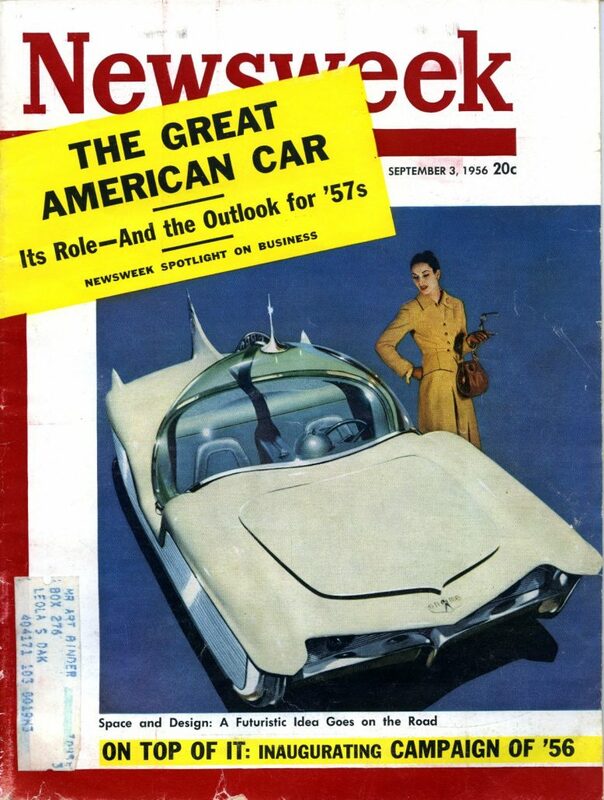 As you know, fiberglass was the “wonder” material that made prototypes a reality. Fantastic shapes, contours, and designs that could only be expressed two-dimensionally in terms of cost were now more easily achieved using ‘glass and a talented designer/fabricator. 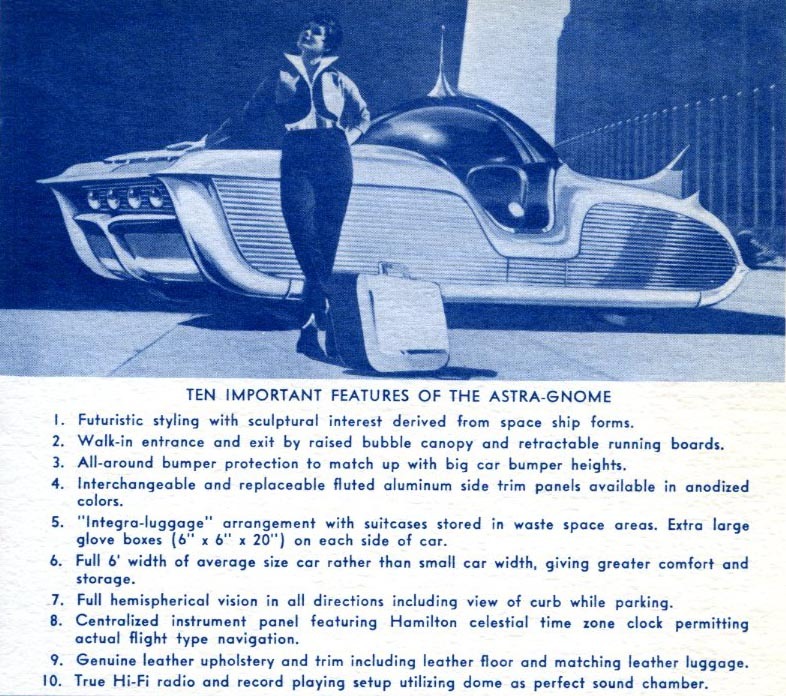 So it’s interesting that Richard Arbib’s concept car, the Astra-Gnome, was built of aluminum. Why? Perhaps the world will never know. But it’s one cool car. 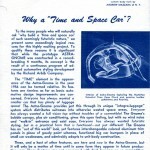 To the many people who will naturally ask “why build a ‘time and space car’ of such seemingly futuristic nature,” we present some exceedingly logical reasons for this highly exciting project. To qualify these reasons it is significant that while the prototype Astra-Gnome was constructed in a record breaking 4 months, its concept is the result of a continuous program of advanced automotive styling development by the Richard Arbib Company. The “Time” element in the appearance of the Astra-Gnome in the year 1956 can be termed relative. 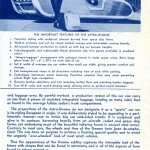 Its features are timeless as far as basic automotive design improvements are concerned. 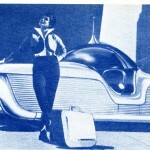 Everyone has always wanted a smaller car that has plenty of luggage space! 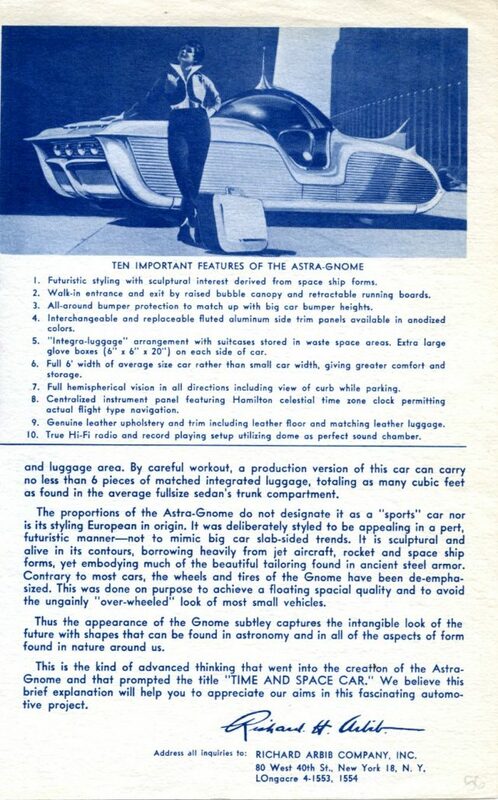 The Astra-Gnome provides just this through its unique “integra-luggage” system with distributes suitcases into otherwise wasted space areas. Everyone has always wanted a full vision top without troubles of a convertible! 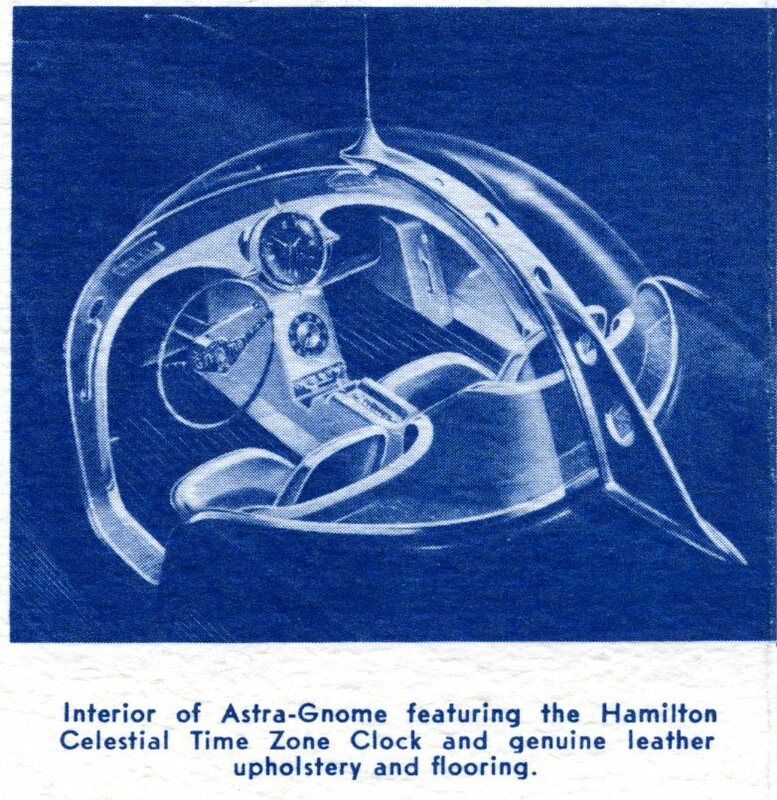 The Gnome’s bubble canopy, plus air conditioning, gives this open feeling, but with no wind noise and “walk-in” entrance and exit ease. Everyone has always wanted futuristic styling, but in a practical form that is functional – not just different! 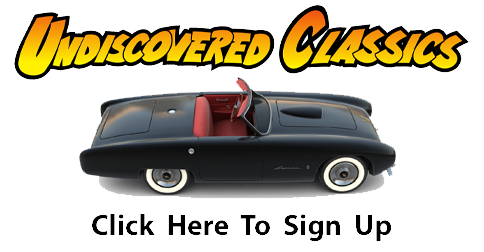 The Gnome has an “out of this world” look, yet features interchangeable colored aluminum trim panels in place of gaudy paint schemes, functional big car bumpers in place of small car weaknesses, and admirably adapts to unit-body construction. These, and a host of other features, are here and now in the Astra-Gnome, but it will only be a matter of time until in some form they appear in future production cars. These features are not concerned with high horsepower or competition car performance, because as product stylists we do not believe the primary task of the appearance designer is a mechanical one. We believe our job is to create new and exciting shapes, textures and colors in a functional car. In the Gnome a totally new driving sensation akin to flying has resulted from this kind of esthetic exploration. The “Space” element in the Astra-Gnome is almost self-explanatory, for the designer of the “personal” car is dealing with a space problem from the very beginning. The 6 foot wide Gnome, because it is wider than most cars of its length (13.5 feet), gives abundant interior room and allows for a phenomenal amount of storage and luggage area. By careful workout, a production version of this car can carry no less than 6 pieces of matched integrated luggage, totaling as many cubic feet as found in the average full size sedan’s trunk compartment. The proportions of the Astra-Gnome do not designate it as a “sports” car nor is its styling European in origin. 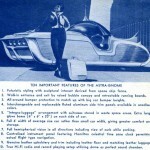 It was deliberately styled to be appealing in a pert, futuristic manner – not to mimic big car slab-sided trends. It is sculptural and alive in its contours, borrowing heavily from jet aircraft, rocket and space ship forms, yet embodying much of the beautiful tailoring found in ancient steel armor. Contrary to most cars, the wheels and tires of the Gnome have been de-emphasized. This was done on purpose to achieve a floating special quality and to avoid the ungainly “over-wheeled” look of most small vehicles. 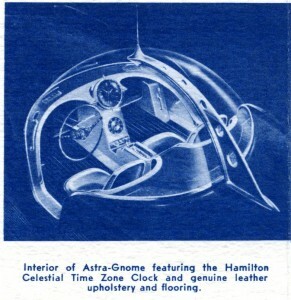 Thus, the appearance of the Gnome subtly captures the intangible look of the future with shapes that can be found in astronomy and in all of the aspects of form found in nature around us. 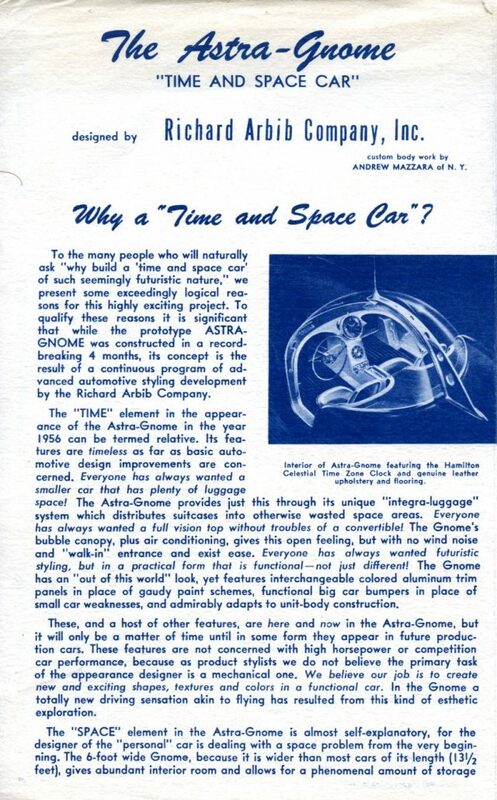 This is the kind of advanced thinking that went into the creation of the Astra-Gnome and that prompted the title “Time and Space Car.” We believe this brief explanation will help you ao appreciate our aims in this fascinating automotive project. 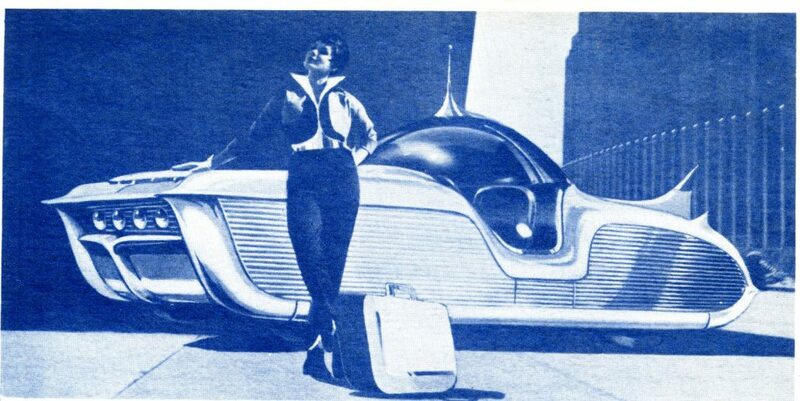 So here we have another futuristic vision of what tomorrow’s cars would look like. 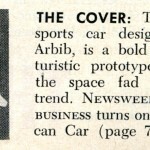 As one of my old professors used to say….”Change is good…you go first.” In this case, how would “you” like to be driving Arbib’s car of the future? 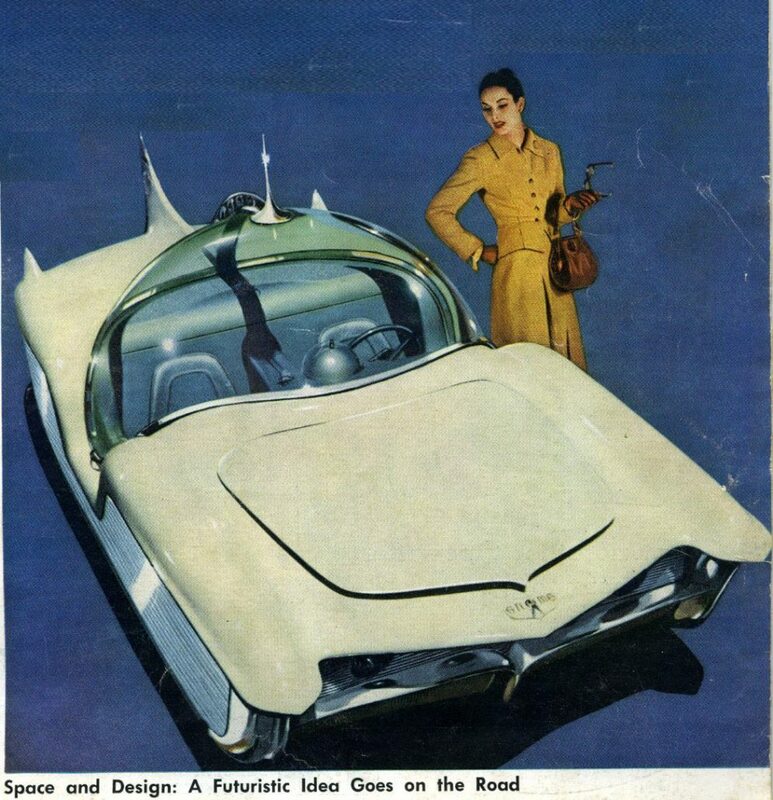 There’s more to share about this fascinating prototype, so look forward to more stories in the future about the “Astra-Gnome” here on Forgotten Fiberglass. It does not get much more wonderfully wild than this… Even more cool than the simple fact it was built is the fact it is a fully functional albeit impractical. 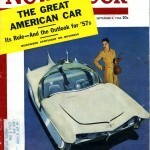 The car is based on a Nash Metropolitan chassis (as I’m sure you’ve seen in the video with the late Jimmy Valentine). They wanted to called it Metro-Gnome, but Nash/AMC had a deal with International Harvester, which owned the name Metro for its delivery vans. IH prevented AMC from using any shortened name or derivative of Metropolitan. So they changed it to Astra Gnome. 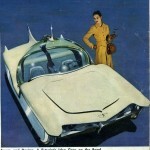 Jimmy found this car in the top floor of a building in New York and managed to coax/cajole Richard Arbib into selling it. Getting it out of that building was a major, major challenge. It required an almost complete restoration, which Jimmy was able to see completed before he died. Geoff you have done it again.I had only seen drawings,Never the real deal..I think in this case the car looks better than the drawings,which is usually the other way around.When I lived in California I went by the Metro Pit Stop,It may have been on a week end because they were closed,so I couldn’t see anything going on.